This section of our website is dedicated to bioethanol fireplaces insert. 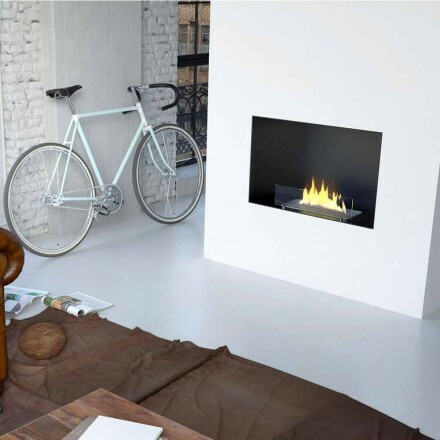 The advantage of these types of fireplaces is that they are easy to install and practical to use, in fact they do not require maintenance and can be positioned anywhere in the home because they do not require flue or power systems. With the bioethanol fireplaces insert offered by Viadurini you can completely revolutionize the look of the walls of your home, with simplicity and comfort. Choose the recessed fireplace with the stainless steel frame to have an elegant design in your living area. For those who prefer the simple and minimal style, there is the opaque black fireplace with protective glass and aromatherapy tray. A fragrant way to delight the evenings in the company of friends. All products are made with high quality material and made in Italy. Contact us at our e-mail address and in our chat to get more information about the operation of bioethanol fireplaces. Our staff will be happy to help you choose the model that best suits your needs. You can contact us by e-mail, at our fixed number or in the appropriate chat.